Working with individual clients is at the root of my financial stress coaching practice to help encourage financial peace of mind for women. It is in one-to-one coaching that clients can achieve deep transformation and empowerment. My clients have described becoming confident negotiators, capable money managers, and determined savers – and those changes have made them happier with the rest of their lives as well. One-on-one coaching engagements begin with an introductory session to determine if coaching is right for you, and if you and I are a good fit. If the answer to both questions is yes, I’ll give you a coaching agreement to complete. In our next money coaching session or two, we will work together to set your goal for the engagement. After that, I will help you progress toward that goal in as many sessions as you want. What Is A Typical Coaching Session? In a typical coaching session, I’ll be asking questions aimed at opening up your thinking. I may also notice and point out patterns that may be getting in your way. From time to time, I’ll give you exercises designed to help you generate insights that draw you toward financial literacy. Some clients request specific financial information, and if that is something you seek we can detour away from traditional coaching and cover that as well. You’ll finish each money coaching session with a few to-dos we select together that will move you closer to your goal. Many clients find that financial stress coaching can produce rapid results. I have had clients make significant changes in their lives after just six sessions. But you get to decide when you are ready to stop, and when that time comes, I will help you lock in the progress you have made and we’ll complete the engagement. You, the client, are in charge of the coaching relationship. You decide what your goal is and you get to decide how you want to achieve it. In turn, I commit to helping you find the resources within yourself that will take you far beyond what you may think possible. I fully believe you have the capability to tame your financial stress and live a happy, fulfilled and healthy financial life, and I am eager to help you achieve that. My clients’ outcomes have experienced a range of results. One found herself able to re-engage with a creative passion she had set aside, and that would help her build financial security. Others report sharply increased financial confidence. Virtually all of my clients say they achieve clarity about how they want their money to work for them, and emotional and practical tools for living a healthy money life. I can not promise that you will become wealthy working with me. But you can achieve greater financial well-being and peace of mind about your finances and your future. You can increase your self-confidence and self-trust. And you can learn to use money as a tool to help you live the life you desire. Note: Coaching is not covered by health insurance. However, some employers have been willing to cover the cost as a form of leadership development or continuing education. If you are self-employed, you can also consult a tax professional about whether your financial stress coaching may be deductible as a business expense. This is not to suggest that it is or isn’t in your situation – just that other professionals may be able to help you find ways to reduce your out-of-pocket cost. I was fairly literate about personal finance when I start coaching with Kelley, but I had slacked off in attention to former goals. Kelley was superb at helping me figure out what my present priorities are, how to move forward both by myself and with my husband, and how to cope with fear caused by setbacks. Kelley is smart, knowledgable, attentive, thoughtful, and witty. I came away from each session feeling relieved and energized. She is an amazing coach and support system. My dad had a talent for numbers. He loved devising investment strategies, doing his taxes, and otherwise managing our family’s finances. Me? Not so much. But only recently—with Kelley’s help—have I learned that this “deficit” doesn’t have to mean diddly in terms of taking control of my finances and retirement goals. With Kelley’s guidance, I addressed my head-in-the-sand approach to financial planning. I realized that I had fears about money that grew out of a general disinterest in numbers and from the message I heard loud and clear in the mumbo jumbo spewed by the personal finance industry: you can’t possibly do this stuff on your own. 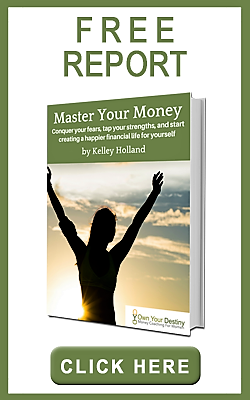 Kelley helped me address my paralysis and to see that just because I don’t want to do a deep dive into investment strategizing doesn’t mean I have to relinquish control. I’m a list maker. And checking “deal with finances” off my to-do list has been a huge relief. I have Kelley Holland to thank for getting me there.